Hanuman Jayanti is celebrated as the birth anniversary of Lord Hanuman. Every year, Hanuman Jayanti occurs on the full moon day of the Hindu month Chaitra. At some places, Hanuman Jayanti is celebrated on the fourteenth day of the dark fortnight in the Hindu month Kartik. It is celebrated on the day of Chaitra Purnima and the date is decided on the basis of sunrise. According to the Georgian calendar, it falls in the month of April. This year Hanuman Jayanti will fall on 19 April (Friday) 2019. Hanuman is the great devotee of Lord Rama and is worshipped for his divine devotion. According to Hindu mythology, people worship Lord Hanuman as the symbol of strength, energy, magical powers and devotion. Lord Hanuman has the power to control the evil spirits and he bless his devotees with peace of mind. Lord Hanuman is a great follower of Lord Rama. Lord Hanuman is also known as “Sankat Mochan” it means that he relieves his devotees in bad times. People remember him in both good and bad times. He is considered to the most powerful God among Hindus. He is son of 'Pawan', the God of Winds and 'Anjanee' often referred to as 'Pawanputra,'. He bless the devoted souls with immense physical and mental strength. According to Hindu mythology, Lord Hanuman is the eleventh Rudra manifestation of Lord Shiva. Once upon a time, there was a great saint named Angira. He went to visit Lord Indra in heaven. Lord Indra welcomed him with the dance of Apsara named Anjani. As the saint did not use to of such dance performance so he started meditating his God and closed his eyes. At the end of the dance, Lord Indra asked about the performance, he said that he was in deep meditation of his almighty as I have no interest in such dance, he cursed Anjani and said she will degrade from heaven. He said that “Anjani” will be born as a female monkey in the mountain forests”. She felt sorry and regretted to the saint. Then the saint showed mercy and blessed that “great devotee of Paramatma will born to her.” He will forever serve Paramatma”. She became the daughter of Kunjar (king of the monkeys on earth) and got married to the Kapiraj Kesari of the Mount Sumeru. She gave birth to the Hanuman with the help of five divine factors such as curse and blessings of the saint Angira, her prayers, blessings of Lord Shiva, blessings of Vayu deva and Putreshti Yagna’s fruit. Lord Hanuman is 11th Rudra avatar in the form of Hanuman as He could not serve to Lord Rama by being in His real form. Lord Hanuman is the rebirth of Lord Shiva as a human being on earth. The whole monkey (Vanara) community including the human fraternity celebrated the birth anniversary of Lord Hanuman. They celebrated with great enthusiasm and joy, dancing. From then, it was started celebrating as a Hanuman Jayanti by his devoted soul to get strength and wisdom like him. As the Lord Hanuman is born to Vanara community, reddish orange color body, this is reason that the temples of Lord Hanuman are generally orange in colour. On the auspicious day of Hanuman Jayanti, the devoted soul take bath and observe fast. In this fast, the Tatkalik Tithi (Ratrivyapini) is taken. The night before keeping the fast, the devoted soul need to sleep on the floor, remembering Ram-Sita and Hanuman. Devoted soul take holy bath early in the morning. The devoted soul take Sankalp for the Vrat with water in hand. After the completion of Sankalp, the devoted soul sit facing the East direction. Face toward east or north while sitting. The devoted Soul chant Hanuman Chalisa in a very polite way. Further, worship Lord Hanuman following all the rituals of Shodashopachar (the 16 rites). The Lord Hanuman devotees apply red tilak (vermillion) to the foreheads of Hanuman idol, read Hanuman Chalisa, offer Prasad of laddoo, do Aarti by chanting mantras and Aarti songs, make the round of the temple and so many rituals. The different aspects of Hanuman are remembered and worshipped on the auspicious day of Hanuman Jayanti. The Mangal dosh effects can be minimized by observing tantric puja on the pious day of Hanuman Jayanti. Lord Hanuman is the symbol of courage, self-control, highest state of devotion, intellect, sense-control and humility. The pious day of Hanuman Jayanti is the best time to offer prayers and praise Lord Hanuman and imbibe all his great qualities in our human capacity. Those who urge to seek the “extraordinary” power like Lord Hanuman , keep fast on the day of Hanuman Jayanti and seek his divine blessings. The saffron colour flag near the Hanuman temples in the highways and even hilly areas is the sign of protection against the negative energies. Lord Hanuman has the boon of immortality, (he is called 'Chiranjeev' for this reason), and it is believed he still exists. When Mata Sita was abducted by Ravan, Lord Hanuman acted as the saviour and he was able to locate the place where Ravan has kept Sita Mata. With his intellect, he build the army and reached Lanka and saved Mata Sita. His selfless devotion towards Lord Ram is always remembered through generations. The Lord Ram reciprocated his devoted by treating him like his brother and this was the reason of meeting of Bheem and Lord Hanuman in Mahabharat. Lord Hanuman is the icon of loyalty to the higher self, strength and faith. Lord Hanuman is blessed with divine powers. 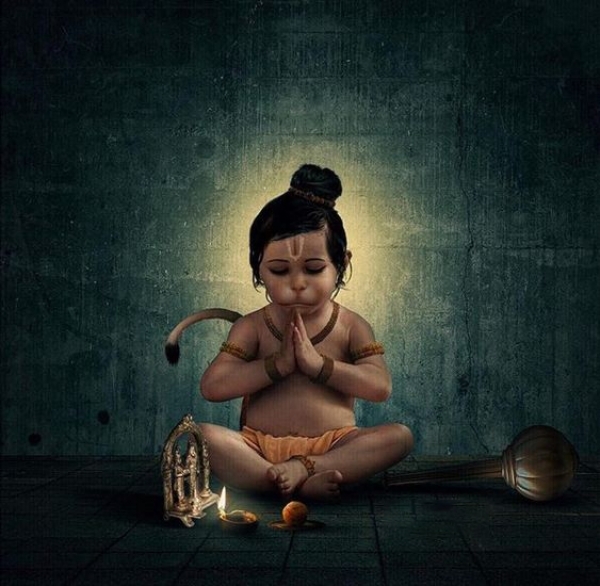 So like Lord Hanuman, we should elevate ourselves spiritually, and achieve the ability to handle our problems even if they are high as mountainous and try to conquer the negativities within us. We may have grown up, but it takes lots of effort to grow spiritually and mentally. The higher self the lord is within us we must evolve in mind and spirit and this can be achieved with the divine blessings of Lord Hanuman. The chanting of Hanuman Chalisa by Sant Tulsidas will bless the devoted soul with Bal(strength), Budhi(Intellect)&- Vidya(Knowledge ). 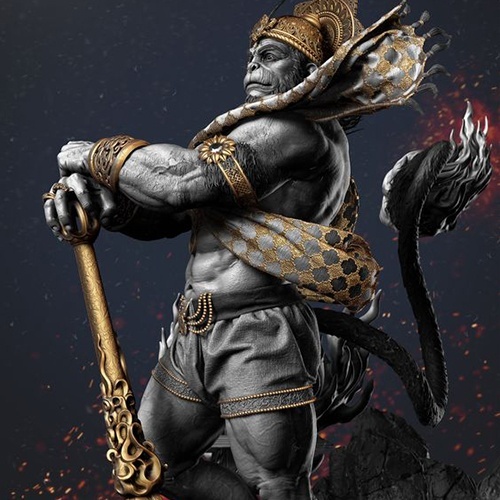 Lord Hanuman is the symbol of strength, let us too follow his example and be a pillar of strength for others.